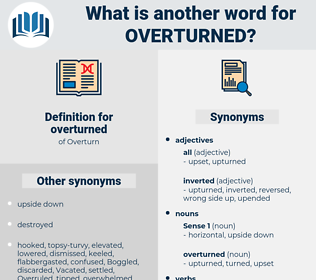 What is another word for overturned? removed, suspended, Ousted, Eliminated, terminated, return, Returned, Vacated, Overcame, extinguished, cancelled, Canceled, rejected, Abolished, dismissed, thwarted, Rebuffed, Superseded, spurned, Denied, revert, Refused, Repelled, lifted, Knocked, Defied, Remitted, rolled, shut, doubled, aside, struck, Disagreed, Blew, scrapped, shot, Plunged, busted, HIT, Skipped, dumped, smashed, Declined, Slipped, Spilled, kicked, fell. Revoked, removed, discontinued, reconsidered, nullified, Abrogated, Overtaken, suspended, Ousted, Eliminated, negated, postponed, terminated, Prevented, overcome, Vacated, overwhelmed, converted, undone, amended, cancelled, Canceled, rejected, annihilated, Ceased, Interposed, reported, transformed, inverted, Excluded, Contradicted, Abolished, Waived, destroyed, dismissed, overlooked, contaminated, Rebuffed, Averted, Deleted, disposed, Denied, altered, deposed, Resisted, forfeited, contested, undermined, Refused, recalled, disrupted, modified, bypassed, upset, vented, ended, Deprecated, devastated, outweighed, void, Voided, Repelled, Forgiven, lifted, Precluded, surrendered, Stigmatized, Knocked, Ostracized, Adduced, disabled, defeated, offset, Avoided, furnished, changed, roasted, Remitted, broken, Wiped, Negatived, lost, doubled, ruined, discarded, Omitted, torn, affected, replaced, struck, avoidable, disturbed, bitten, cracked, Screened, barred, scrapped, Plunged, Strayed, Disclaimed, fractured, busted, sidelined, HIT, Emitted, damaged, Screwed, Discounted, placed, dumped, smashed, Declined, Shifted, discharged, shocked, cleared, released, missed, Spilt, chipped, Spilled, kicked, Dealt, fallen. Overruled, invalidated, Refuted, nullified, Abrogated, Annulled, Countermanded, Overthrew, Toppled, Rescinded, Quashed, repudiated, reversed, Withdrew, Disallowed, surrendered, broke, Omitted, Capsized, dropped, Flipped, Crashed, downed. Overruled, invalidated, Overridden, Annulled, Subverted, overthrown, Rebutted, Toppled, Rescinded, Quashed, repudiated, disqualified, Repealed, reversed, withdrawn, Disallowed, Aborted, thrown, Capsized, dropped. organized, clear, methodical, systematic, ordered. Trees are sometimes torn from the ground, and houses overturned, by a strong wind. If it got its tusks over the side, we should either have a plank ripped out or be overturned.